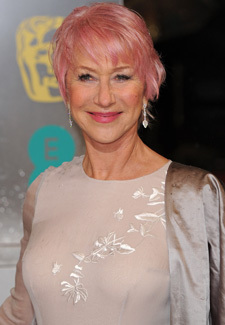 When we posted up a photo of Helen Mirren, 67, on Facebook on Sunday night, you gave a resounding thumbs up to the pastel pink shade. Vicky Jenkinson Tyson gave her verdict, ‘ Think she looks pretty. Lovely colour. Softens her face does make her look younger. Go Helen! Helen’s colourist for the evening Jessie Knight, Senior Colourist at John Frieda reveals what inspired the daring colour change. It was the hairstyle of the night with Judi Dench, 78, looking fabulous with her do given a spikey treatment, and Anne Hathaway, 30, showing that it’s a style that can work whatever your age.